Douglas Lyon, Fairfield University, Fairfield CT, U.S.A.
Thomas Rowland, Pitney Bowes, Shelton CT, U.S.A.
to complete your siege engineering. This paper is the final in a series of papers that describe a new plug-in for enabling the integration of the IntelliJ IDEA IDE with the JBoss application server. The JBoss plug-in was first conceived and implemented by Martin Fuhrer at Fuhrer Engineering. Parts 11, 22 and 33 discussed how to download and install the plug-in, how to create a project containing a web module, a session bean, a servlet, and an application module for deployment to JBoss. This paper discusses deployment and execution, showing how to create a remote deployment method using SSH Transfer, and a run configuration for both local and remote deployment. Without an automated environment, deployment is often a painful process resulting in developers spending a great deal of time performing application deployment tasks. Most organizations strive for better management of this critical phase in the development cycle. By automating these tasks, a team can execute deployment in less time with more repeatable, predictable and measurable results. The IntelliJ IDEA provides built-in deployment support for J2EE applications that we will use via the JBoss plug-in. This integrated deployment environment will allow us to connect to the JBoss application server and copy the application module (the EAR file) to it automatically. This deployment method is used when the JBoss server is running on the developer’s machine. No additional setup is required. Provides a secure connection between the local client and a remote host. 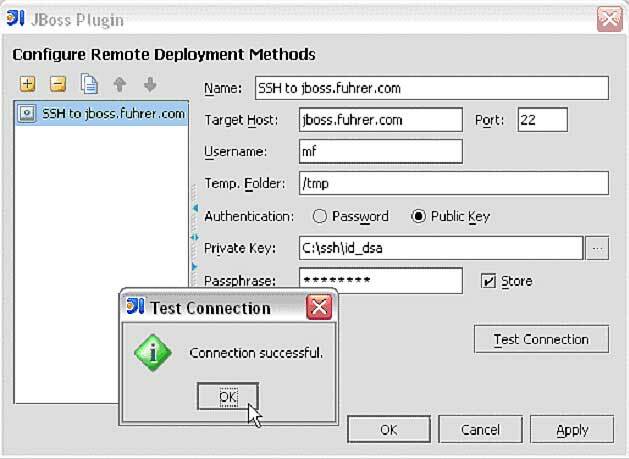 To make the application accessible by the JBoss server, the EAR file is transferred to the remote machine using an SSH (Secure Shell Client) connection prior to deployment. The SSH connection is using SSH2 with either password or public key authentication. You have to specify a temporary directory on the remote machine where the EAR file is temporarily stored, e.g. /tmp. This works exactly like the SSH transfer deployment method, but an FTP connection is used to transfer the EAR file instead of an SSH connection. The FTP connection may be either active or passive. This may be used when both the local developer’s machine and the remote deployment machine have a common filesystem, e.g. through NFS, Samba, or whatever. You have to specify a local path and a remote path, both pointing to the same shared directory. With HTTP callback the EAR file isn't transferred to the remote machine, but the JBoss server is told to open an HTTP connection back to the developer’s machine and load the EAR file from there. This implies that the developer’s machine has to be visible by the remote machine, i.e. the developer’s machine may not be connected to the network through DHCP. To create a new SSH Transfer deployment method select the File:Settings menu item to bring up the Settings dialog box. 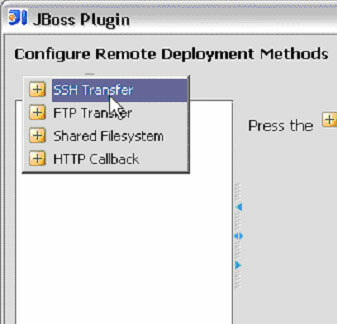 Select the JBoss Plugin control device, as shown in Figure 1.1. Enter the connection data required to connect to the remote machine and test the connection by selecting Test Connection, as shown in Figure 1.3. After the connection has succeeded, select OK.
You are now ready to create a run configuration, as shown in the following section. The second part to preparing deployment is the setup of a run configuration. Here, you specify application server, startup options, and the modules that are to be deployed. You can create as many run configurations as you like. In this section we will create a local run configuration for a local deployment, and a remote run configuration using the SSH Transfer deployment method we just created. To access the run configuration setup, select the Edit Configurations menu item from the Run menu, as shown in Figure 2.1. Enter a name for the new configuration. On the Server panel, select the JBoss application server and select the default server instance. Checking the Start Browser checkbox will launch the browser when you launch the application, so you don’t need to have the browser open at the time. On the Deployment panel, you specify the modules that are to be deployed. Select the app module and then select app.ear from the dropdown. Remember app.ear is our EAR file containing our entire enterprise application that we want to deploy. The Startup/Connection panel allows you to configure startup and shutdown scripts and parameters to be passed to the JBoss server. The defaults as shown in figure 2.5 should be acceptable. Select OK and your local run configuration is complete. When you run your application the EAR file will be deployed, JBoss will be started and a new browser instance will be launched. Enter the host name of your remote host running the application server in Remote Connection Settings. The name must match the host name you entered in the remote deployment method. As soon as you entered the correct host name the list of available deployment methods is populated by all matching methods. Choose the deployment method you want to use to deploy the EAR file to the application server. The complete setup for the remote configuration is shown in Figure 2.7. Select the Deployment tab and use the settings as shown in Figure 2.4 for the local deployment method, as they will be the same. The Startup/Connection panel contains no settings for a remote run configuration. You have now finished creating a run configuration and are ready to run and deploy your application. This section discusses deployment and execution. We will use the remote configuration in our examples. If you are using the local deployment method created above, JBoss will automatically be started. In both cases, a new browser session will be launched. It is a good sign if there are no exceptions during startup. If there are, you may have a configuration problem (e.g., 4.0.1RC1 is not compatable with JDK1.5, etc.). To further confirm the correct operation of JBoss, you should visit the application server at the default port of 8080. If JBoss is running, you should be able to see the JBoss console, as shown in Figure 3.1. Select Run	from the IntelliJ IDE and, if all goes well, you should see some messages like the ones shown in Figure 3.2. Before the application is deployed into the JBoss server, the EAR file is transferred by SSH into the temporary folder configured in the deployment method, e.g. /tmp. The EAR file is then picked up by the JBoss server from there. Any exceptions or errors occurring during deployment are logged in the run window of the IntelliJ IDE. One common problem is that the web browser is started by the IntelliJ IDE before the deployment of the application has completely finished. This results in a missing resource error displayed in the browser as shown in Figure 3.3. Reload the web page manually after deployment has finished to display the servlet correctly. If the web server is running properly, the application is deployed, but the servlet is still not displaying in the browser, you must start to examine log files. There are log files on the development machine and log files on the application server. “ejb not bound” or less likely “Could not dereference object”. Check for any JNDI name mismatches in the EJB and/or servlet configuration to solve the problem. Make sure you are using the correct ejb logical reference name in your servlet code. If all goes well, you should see a reply, like that of Figure 3.4. 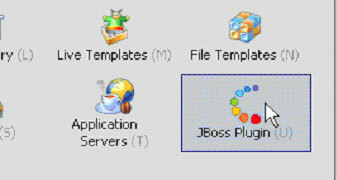 The JBoss plug-in is freely available and its download is integrated into the IntelliJ IDEA IDE. The process of creating modules and entering in data is error-prone and tedious. Ideally, there should be an easier way to incorporate EJB’s into the development environment. If the mapping, at run-time, should fail, an ejb not bound exception will be thrown by the servlet. It would probably be better software engineering if such an error were a syntax error and not a run-time error. This would probably mean having to engineer JNDI out of the process, an activity that is beyond the scope of this paper. Martin Fuhrer has a degree as engineer in computer science from the School of Engineering and Information Technology in Biel/Switzerland. He is founder and president of Fuhrer Engineering Inc., a software development company located in Biel/Switzerland. He's mainly working in the field of web-based financial services and the online processing of realtime stock exchange data. He can be reached at info@fuhrer.com or through http://www.fuhrer.com. Thomas Rowland has a B.S. in Electrical Engineering and an M.S. in Software Engineering. He has been consulting as a Software Engineer for the past four years, working for Pfizer Pharmaceutical, Travelers Life & Annuity, and currently at Pitney Bowes. He has also worked for Hyperion Solutions for over 5 years. Mr. Rowland has also had some teaching stints along the way. He is listed in the National Register’s 2005-2006 edition of the Who’s Who in Executives and Professionals. He resides in Connecticut and can be reached at rowlandtf@netscape.net.